As any of my readers and followers may know, I have quite the beauty product obsession. I'm always on the hunt for what's new, innovative, a cult classic, you name it. For some girls it's shoes, for me it's always been beauty. Now for the past couple months, I've encountered a selection of products that are my new front runners. 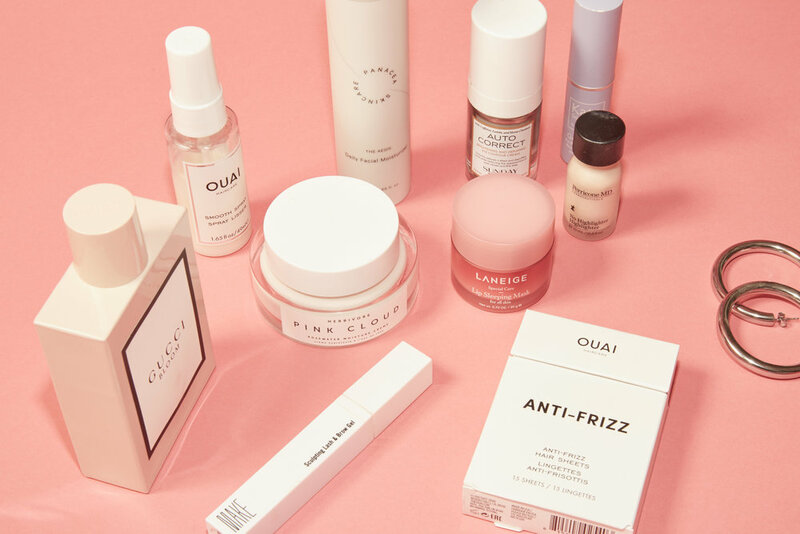 I use a lot of products as many know, and always find incredible ones- but I finally broke it down to some stand out hits, and I'm excited to share each one with you all. I haven't broken out in weeks, my skin is glowing and dewy despite the harsher winter conditions, my dark circles diminished, hair smooth and frizz free. I know that these products are special, and they've really amped up my routine, and I think they'll change the game for you too. Panacea "The Aegis" Cleanser- I always get excited when I find a cleanser that makes my skin literally tingle post use. This one manages to get everything you don't want, like dirt and excess oils on your skin off, while still keeping your face from losing moisture and life. I've used this guy endlessly this month, while working with Panacea on a 21 day challenge where I started each and every day of the challenge with intention, and that started with good skincare. Not a bad habit to create. Epicuren Discovery Apricot cream cleanser- When it comes to all skincare products, I'm always pleasantly surprised when there is a really delicious scent. It's never a requirement, but when you come across an addicting smell in your cleanser, you can't help but get hooked. This one smells like fresh apricots, and does what any dream cleanser should do. Its creamy, deep cleaning and refreshing to use morning and night. Herbivore Botanicals "Pink Cloud" Moisturizer: "Finally, the perfect moisturizer." their website says. They weren't kidding. I've always been addicted to Herbivore Botanicals line for their really special, stand out products. This one is certainly my favorite launch to date from them. It makes my skin clear, calm and hydrated and keeps the inflammation at bay. I highly credit this moisturizer as the one that's calmed my hormonal acne without drying my skin out. It manages to keep me super dewy during the winter, which is a near impossible feat, while also controlling the oily t-zone troubles. The Rosewater and Aloe water in this cream make for an insanely perfect combo for my skin. Origins "Drink Up" intensive overnight mask- So, this one should technically be filed under the mask category coming up, but I've been breaking the rules and using it as a moisturizer, night AND day. It's sold as a sleep mask, but it can be so much more than that. Perfect for long plane flights, cold windy days, a good (or too short) night of sleep, the list goes on. It manages to look good under makeup for day time, and although it's considered heavy, it absolutely doesn't clog pores. Just makes you extra hydrated- no complaints there. Don't be afraid to try it in the day time if your skin is craving hydration. Panacea "The Aegis" daily facial moisturizer (and their sunscreen)- Another two amazing products from Panacea. The moisturizer is super hydrating, clarifying, and soaks in fast so you don't need to worry about it lingering too long on the surface of your skin. I find this one works perfectly under the most makeup, as it primes and preps the skin for application of both their sunscreen and whatever glam you have planned for the day. Their sunscreen is a product that I don't know how I lived without. It's thin, hydrating, and doesn't break me out (that rhymed!). So happy I found this brand. Lush cosmetics "Mask Of Magnaminty"- My first experience with Lush cosmetics products, and certainly wont be my last. This is in many ways the ultimate mask. It's minty and tingly, deep cleaning and exfoliating, calming and soothing. When pressed for masking time, this one does it all. Laneige lip sleeping mask- During the winter, my lips are always the first thing to get dry and flaky. No lip scrub or balm seems to do the trick 100 percent once this time of year comes. I picked up this lip mask on a whim, and fell in love after the first night. Layer it on before bed, and wake up with the most hydrating supple lips ever...and that's after just one night. I also broke the rules with this one and have used it in the day time as well. Sunday Riley "Auto Correct"- This new launch from Sunday Riley does not disappoint. I'm always on the quest for the best eye creams, and this one has my full attention considering it came from one of my most loved brands. Read a full review and feature on my beauty section from last month, here! Kate Somerville goat milk de-puffing eye balm- This is one of the most effective eye treatments ever, and it's instant. It's cooling, massaging, and I swear I watch the under eye bags disappear instantly. I usually layer this on top of another eye cream, to both double up (because why not), and to massage the previous cream into my skin even better and faster. Caudalie "Vine[Activ]" energizing and smoothing eye cream- When recently browsing my favorite local beauty store Violet Grey, I was told about this eye cream Caudalie. With little personal experience of the brand, I took a chance based off a single recommendation. This is one of those eye creams that goes on so nicely, works so instantly, and feels so good that you know and see it's doing something others are not. Ouai Anti-frizz sheets- The cutest little packaging I've ever seen first of all. It's hard not to start there, but I'm just having to state the obvious. Looks cute in your purse, on your table, in your cabinet, in your car...which happen to be all the places I wish I had one all at once. Outside of the cute packaging, these little disposable frizz sheets straight up get rid of every little fly away and static issue I'm faced with, smell good, add shine and hydrate, and are so good for being on the go. Ouai smooth spray- I use this daily without fail. That says a whole lot coming from a girl who almost never used a single hair product for her entire life, till I met Ouai. KKW beauty "Ultralight Beams Duo"- KKW beauty is one of my new official favorite makeup brands. From the contour kits, to the KKW fragrances, to these high shine loose powders in the ultralight beam duos. I've been using the loose powder in rose gold in every makeup look i've created since i got my hands on it. Works on eyelids, cheekbones, even over a glossy lip. The warmest, most beautiful glow. MAKE beauty sculpting lash and brow gel- I always say, if you have no time at all to do a thing to your face when it comes to makeup, brows being brushed and somewhat "styled" is the one thing i'd do. I take my brows very seriously- I at home tint monthly, fill in with pencil, and always use a clear gel to brush them up. This one is my favorite, and makes for the most perfectly styled brows. Perricone MD "No highlighter highlighter"- I can't help but love what Perricone MD is doing with their "no makeup makeup" product line. This is actually my first buy from the line, even though i've been admiring the products for quite some time. Lately, my go-to makeup look really has been a nice little extra glow/highlight. This one works for both the days you want to put nothing but moisturizer on, and the days where you're going full glam, although I find this one is best when you're pressed for makeup time, and just need a little extra subtle glow that looks nothing like makeup at all, but your real skin entirely. Gucci Bloom: The past couple months, I've went hard on amping up my fragrance collection. I've fallen madly in love with Gucci Bloom. A very floral, feminine scent that lingers all day and sits well on the skin. I also can't help but love the bottle on display in my place as well, which is always a plus when it comes to beauty.